Seven Lawrence University students wowed a judging panel of professionals with an eight-minute scene from Mozart’s “Marriage of Figaro” to earn first-place honors in the recent Collegiate Opera Scenes Competition. 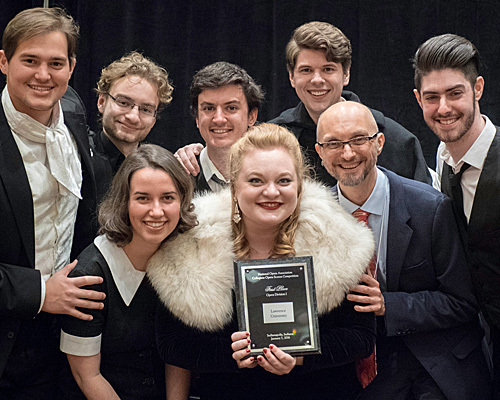 Lawrence students were all smiles after winning the Collegiate Opera Scenes Competition. Showing off their first-place plaque are (front row, l. to r.) Katie Mueller, Kayla Siembieda and director of opera studies Copeland Woodruff. Back row (l. to r.): Mitchell Kasprzyk, Derrick Hahn (accompanist), Jackson Rosenberry, Josh Eidem and Paul Gutmann. Held Jan. 7 at the Conrad Hotel in downtown Indianapolis, Ind., the competition was part of a national joint convention of the National Opera Association and the National Association of Teachers of Singing. Six singers, all seniors — Josh Eidem, Paul Gutmann, Mitchell Kasprzyk, Katie Mueller, Jackson Rosenberry and Kayla Siembieda — and junior Derrick Hahn as accompanist on piano, performed the Act III sextet from “Figaro” in front of an audience of more than 300 that included directors, educators and international artists, among them legendary operatic stars George Shirley, Esther Hinds, Thomas Young, and Donnie Ray Albert. “The convention and competition was a wonderful opportunity for our students to step outside their bubble and see where they stand in relation to their peers,” said Copeland Woodruff, director of opera studies at Lawrence. “It also afforded them the opportunity to perform for and meet opera professionals, colleagues and educators, who helped them understand what a tightly knit community the opera world is. They received valuable feedback and audience response, including that from well-respected, graduate school educators with their eyes on potential students. Selected on the basis of a submitted video, Lawrence was one of just five finalists chosen to perform in Division I of the competition. Lawrence competed against performers from DePauw University, Kennesaw State University, Michigan State University and Sam Houston State University.